This outdoor living space packs in as much of the “living” part of outdoor living as you can get. Once this structure is completed the homeowners will have plenty of room to entertain in their new outdoor living room, as well as provide a special place for an evening at home. This structure will have it all. 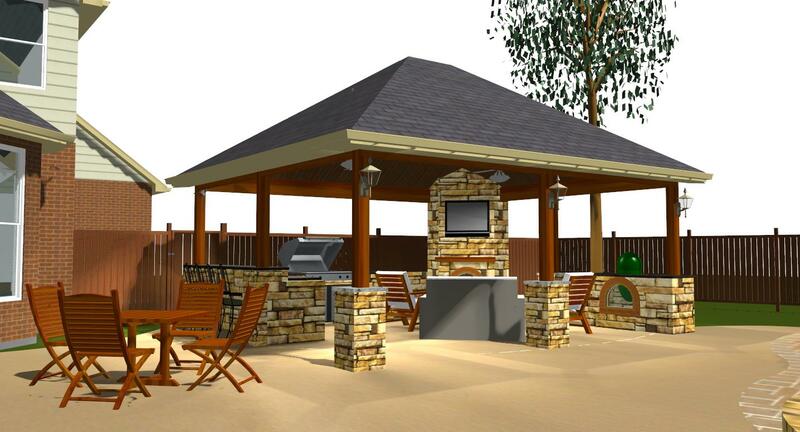 It is being built with an outdoor fireplace, and an outdoor kitchen which will be equipped with a Big Green Egg smoker, the patio will also have an area above the fireplace that awaits the installation of the homeowners big HDTV over the fireplace. It doesn’t get any better than this. This design rendering shows what the grand finale will look like. Since the detached patio sits in close proximity to the homeowners pool, we are using a CoolDeck concrete floor in the detached patio that matches the surround of the pool itself. The large beams that support the detached patio are housed in beautiful columns that encompass a continuation of the stone with a knee-wall height ledge/border that runs the entire perimeter of the structure. The outdoor fireplace is also finished in stone as well. The combination of the wood and the stone is going to make a stunning ,unique and rustic looking retreat once completed. This structure will be a great place to get away from the stresses and worries of work and obligations, a place to just relax in beauty and relaxation. 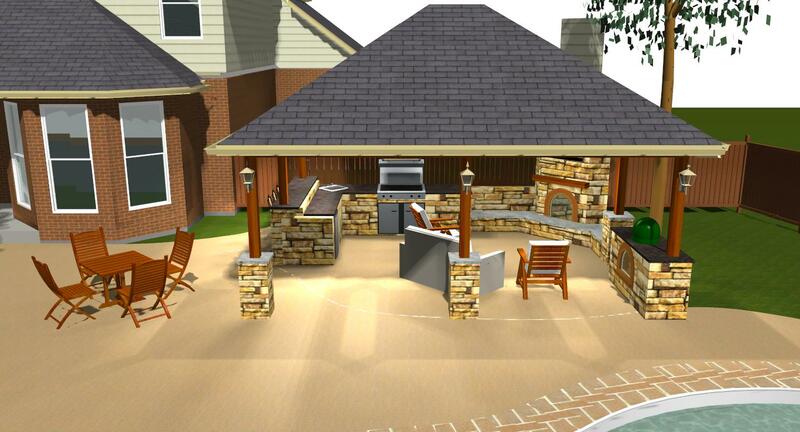 The outdoor kitchen is being equipped with all the accoutrements to make the kitchen fully functional on it’s own. The kitchen will have a Big Green Egg smoker, a grill, a side burner, ice maker, refrigerator and a kegerator. Imagine watching the big game on Sunday with the guys in all this convenience and luxury, i can see this outdoor room quickly becoming the “place to be” each weekend. Yummy- the Big Green Egg in action. Did i mention the Big Green Egg? Even though the name makes you imagine the famous children’s author, Dr, Seuss, there are no “green eggs and ham” cooking up in this wonderful smoker. 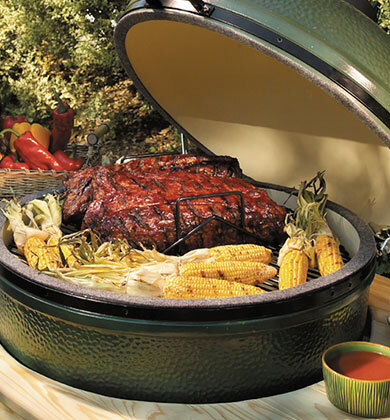 Big Green Egg smokers have become all the rage in outdoor structures and among those that like to grill out in style. These smokers and grills are considered to be one of the worlds best. These smokers are being used by many who cook at the competitive level. Their smokers use smoldering wood and low temperatures to help you create mouthwatering meats that are so tender you won’t need a knife. Here is another view, capable through our custom design renderings, of how the completed structure will appear from another angle. Detached patios that are close to pools and other water features, and even lakes, are sometimes referred to as detached cabanas. The two structures are really no different except when you hear the word cabana you imagine the capabilities to be reminiscent of a luxury resort where the water is only a few feet away. Once completed, this structure will have the capabilities that would rival any 5-star resort. This entry was posted on September 14, 2011 by austinporchandpatio. It was filed under Austin outdoor bar, Austin outdoor kitchen, Austin outdoor stove, Austin patio cover, Big Green Egg smokers and grills, Covered patio Austin, Covered Patios, Flagstone, Flagstone Patios, Outdoor fire place, Outdoor Kitchens, Patios, Professional Design Rendering and was tagged with Archadeck of Austin, Austin covered patio, Austin covered patio deck, Austin outdoor fire place, austin outdoor fireplace, Austin outdoor kitchen, Austin outdoor room, Austin patio builder, Big Green Egg smokers and grills, CoolDeck concrete floors, Custom design rendering, Detached cabanas Austin TX, Detached patios Austin TX, outdoor fireplace, Outdoor firplaces Austin TX, Outdoor kitchens Austin TX.